The short story "Lyddy! ", by Thomas Egerton Wilks, was published in a London journal, The Young Lady's Magazine, in 1837, its first year of publication, the works from which were collected in a single volume published in 1838. ...to concentrate every energy in the production, not only of such matter as may amuse the fancy, but at the same time tend to expand the mind, elevate the morals, refine the intellect, and awaken, -- not the morbid sensibilities, too often produced by ill-selected fictions -- but those pure, unhacknied feelings of the youthful heart, which are in themselves a mine of inexhaustible treasures, and which, by their development, shed a halo of enchantment around. ...may sparkle and be redolent of mirth, but their wit shall never inflict a wound, and their humour shall never be tainted with aught offensive to the chastest delicacy. I don't generally spend a lot of time reading uplifting moral tracts, but I tripped over "Lyddy!" in one of my regular searches for nineteenth-century women's fiction with ballroom scenes. 2016 being a leap year, some folks have been chatting about leap year balls or leap day dances, including the idea of such balls being a traditional occasion for ladies to ask gentlemen to dance, rather than the standard vice-versa. I'm not sure how far back that tradition actually goes, but it reminded me of an amusing story published in Atkinson's Saturday Evening Post & Bulletin in 1835, entitled "The Ladies' Ball". Atkinson's Saturday Evening Post & Bulletin was a Philadelphia newspaper published under various names from 1800; Samuel Atkinson was the publisher from 1831-1839. Along with domestic and foreign news, Atkinson also included essays, fiction, poetry, household hints, etc. Its descendant survives to this day as the bimonthly Saturday Evening Post, famous in the mid-twentieth century for its Norman Rockwell covers. "The Ladies' Ball" tells the story of a social crisis: the gentleman of a certain nameless city, distracted by the study of mnemonics and other sciences, had forgotten to organize the traditional Christmas ball. some more conjugal kind of movement, either waltzes, mazurkas, or galopes, that rivet a couple together for a whole evening till (we would fain hope) they were sick of one another and themselves. Note the implications of "conjugal" there. In their sudden concern for "propriety", the French were abandoning the relatively innocent country dance in favor of dances like the waltz and galop that kept the dancers in each others' arms and had thoroughly scandalized the English in the early decades of the century. Their constancy to their partner would appear but a poor offering when they fear to endanger it by interchanging it with another. The English were not exactly in a position to criticize the morals of the French in this area, but underneath the geopolitical sniping, there is an interesting point of ballroom etiquette. Here's an interesting little tidbit that's a good reminder of some of the things we don't know about early nineteenth century social dance. The article at left, "Present State of Dancing in Paris", appeared in the April, 1822, issue of Bell's Court and Fashionable Magazine, better known as La Belle Assemblée. 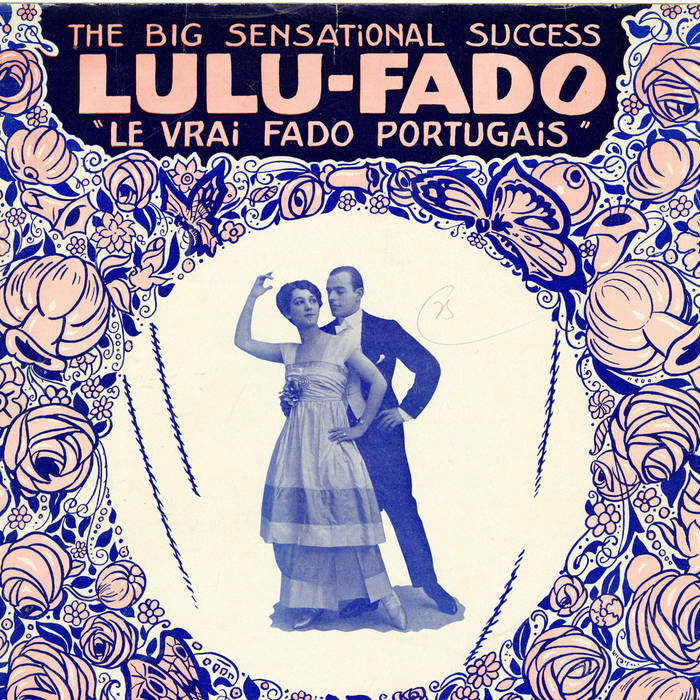 "Spanish dances are quite the rage; and the term may be well applied to the Bularo, which, when danced in the best manner in Spain, always reminded me of two persons scolding each other: this dance, with the Fandango, is much in favour now in Paris; and the French ladies dance them in a manner, which would make one imagine they had long sojourned in Spain, or, at least, among the Pyrenees." "Spanish dances" here seems to refer not to the variant country dance form but rather to dances for couples, or possibly for solo female dancers. Male and female dancers both use castanets, and the (presumably female) Fandango dancers wear "Chinese crape pantaloons lined with levantine." "The waltz and Le Moulinet still, however, continue in high favour: the diversity of steps introduced in all dances is astonishing; and the agile movement of the small feet, all in white satin slippers, absolutely dazzle the eyes." Note that these appear to have been exclusively French feet. English ladies are declared notable for the "elegance and vanity of their attire" and "the intrinsic worth of their jewels and ornaments". I would guess Le Moulinet to refer to quadrilles, which were indeed blessed with a wild diversity of steps in this era. I'd be quite curious to know how diverse the waltz steps were; surviving sources don't provide nearly as much variation as for the quadrille. "The shuffling step, I am sorry to say, à la Portugais, is not yet out of favour." Apparently Portuguese steps were not as admired as Spanish ones. Click the photograph to enlarge and read the whole thing! of early nineteenth-century women's magazines. While never a prominent format, the Swedish dances became enough of a success to outlast their originator. In the second edition of his Companion to La Terpsichore Moderne (London, c1830), dancing master J. S. Pollock, “Professor of Dancing, late of Paris” gives figures for many of the unusual country dance formats originating in the late 1810s and early 1820s, among them three different sets of figures for Swedish dances. Pollock describes the Swedish dances as being suited to either a lady between two gentlemen or a gentleman between two ladies, though his instructions are invariably for the latter configuration. His diagram suggests a set of trios all of the same configuration. Interestingly, Pollock explicitly states that “no change of places is to be made either at the top or bottom of the same,” meaning at the ends of the set. This means that a right-hand dancer going down the set would become a left-hand dancer coming back up, a minor complication which Pollock was either indifferent to or regarded as a feature. A year or so ago I published a discussion and reconstruction of the 1862 country dance gallopade known as The Gothic Dance and mentioned that there was a very similar dance in London dancing master J. S. Pollock's c1830 manual, A Companion to La Terpsichore Moderne (Second Edition). I've taught this dance at the few 1830s events I've had an opportunity to run, but have not previously published a reconstruction. All advance, retire, and cross over, changing places with partners -- advance, retire, and cross over back again -- first and second couples right and left -- first couple gallopade down the middle to the bottom of the dance, and remain at the bottom. The similarity to the Gothic Dance as well as to the traditional English Galopede, which this appears to be an early version of, is obvious in the advance/retire/cross over pattern and final gallopade, though the Gothic Dance is far more creative in its figures. This dance is simple and rather sedate by comparison! This new and fashionable dance, which it appears is of Russian origin, was first introduced into this country at His Majesty's ball, St. James Palace, on the 11th June, 1829, when the Princess Esterhazy, the Earl of Clanwilliam, the Duke of Devonshire, and some of the foreign ministers exerted themselves in teachings its novel movements to the company, and was danced alternately with Quadrilles and Waltzing during the whole of the evening. All slides are performed along the line of dance. The default turning direction is clockwise, though counter-clockwise turns are also possible. The first set are performed with the first foot (gentleman's left, lady's right) with the second foot then closing behind in order to again slide with the first foot. The second series is then performed by sliding with the second foot and closing with the first. The galop sequences may also be extended to four bars per set, i.e. "eight-slide" galops. This description is consistent with most galop sources from the mid-century onward. But oddly enough, that's not how it's described in the source from which the quotation above was drawn. 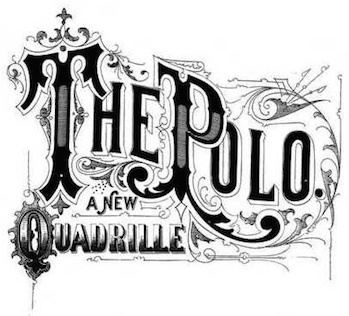 The Royal Gallopade is an interesting mix of popular 1830s dances, with elements borrowed from country dances, galopades, and quadrilles, plus a concluding sauteuse waltz. My only source for it is the Companion to La Terpsichore Moderne (Second Edition) by J. S. Pollock, London. It is undated, but the mix of dances and a textual reference to an 1829 event suggests the early 1830s. Pollock claims that gallopades "appear" to be of Russian origin. Among those he credits with their introduction is the sixth Duke of Devonshire, who was a close friend of both the Prince Regent (later George IV) and Czar Nicholas I and had traveled to the Russian court. Pollock depicts the original gallopade as a choreographed sequence dance for a circle of couples with gallop interspersed with short dance figures and gives not only this original but gallopades in country dance and quadrille form. 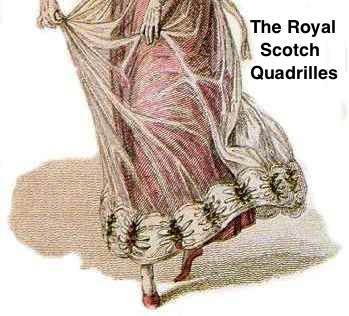 Fittingly, the Royal Gallopade is given a separate section of its own between the quadrille and country dance gallopades. Gallopade (as described in the original Gallopade) straight forward to the top of the room the lady crossing the gent at the end of each four bars; on arriving at the top, the first couple in one set, faces the first couple of the other set; the second couples faces the second, and so on to the bottom of the dance, then each four perform the figure of Le Pantalon -- the whole of the party then face the bottom of the room, and gallopade as before -- then perform La Poule -- gallopade to the top of the room, and finish with the sauteuse round the room. While given as a social dance, this makes a spectacular performance piece as well.